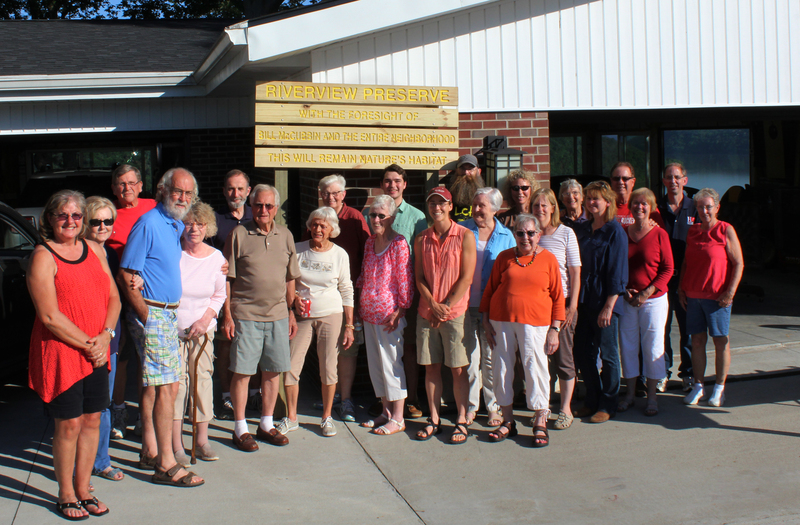 Neighbors along Riverview Drive worked together to conserve a nearby forest as nature’s habitat. Turn onto Riverview Drive in Hanover to find a winding road that ends on a bluff overlooking the Ohio River. The drive is bordered by family homes and steep, wooded hillsides that head down into valleys. When a 3.5 acre portion of that steep forest came up for auction last Fall, something impressive happened: the neighbors joined forces to protect the woods. In June 2017, these neighbors gathered to celebrate turning this parcel into a nature preserve with Oak Heritage Conservancy. At the time of the November 2016 auction, there were rumors about potential development of the forest. The neighbors realized that they all enjoyed those woods along the road as a place to walk and enjoy nature. Only days before the auction, Bill McCubbin, a Riverview resident, and a few other neighbors acted quickly. They handed out invitations, door to door, at lunchtime, for a 4pm gathering that same day. Everyone living along Riverview Drive was invited to be part of a conversation about how to protect the forest. Many individuals came to that initial meeting and immediately pledged funds to support the purchase of the property that weekend. McCubbin represented the neighbors at the auction and successfully bid for the property. A subsequent meeting focused on how to protect the property permanently. Several neighbors had heard about Oak Heritage Conservancy, a local nonprofit organization that conserves natural areas for the public good and offers nature programs. They work throughout southeast Indiana, but they are based in the town of Hanover and have conserved two other natural areas in Jefferson County. The neighbors contacted Liz Brownlee, Executive Director of the Conservancy, immediately. The parcel on Riverview Drive is smaller than most of the natural areas that Oak Heritage Conservancy protects, but there was a clear ecological benefit to protecting the land. The parcel – now called Riverview Preserve – connects to the large swaths of forest at Clifty Falls State Park. Wildlife need contiguous habitat so that they can forage, breed, and seek shelter. This connection made Riverview Preserve a priority for the Conservancy.